The Baker Hughes U.S. rig count was down 87 rigs this week to 1,456. Oil rigs were down 83 to 1,140, gas rigs were down five to 314 and miscellaneous rigs were up one to two. 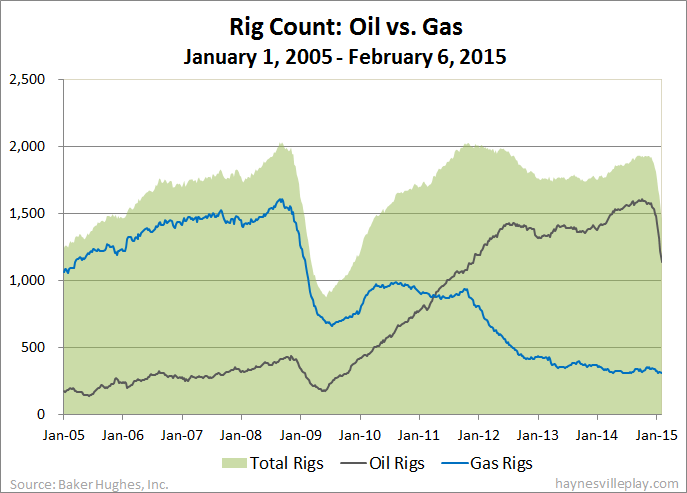 Since the oil rig count started plummeting over the past nine weeks, it is down 435 rigs, or 27.6%. By type, horizontal rigs are down 80, vertical rigs are down two to 233 and directional rigs are down five to 135. Among gas rigs, horizontal rigs are down one to 239, directional rigs are down seven to 42 and vertical rigs are up three to 33. Look how the dark gray line (oil rigs) mimics the crash in gas rigs in 2009 (blue line). It might even be steeper, although I don't think it will dip as low as gas rigs did back in '09, but WTF do I know about oil?? ?